EN 12871 Wood-based panels - Determination of performance characteristics for load bearing panels for use in floors, roofs and walls - This European Standard specifies: - concentrated load test and assessment methods for floor and roof decking; - soft body impact assessment methods and classification system for floors, roofs and walls. This European Standard does not include racking testing or uniformly distributed loads as these are covered by testing according to EN 594 or calculation according to EN 1995-1-1 respectively. 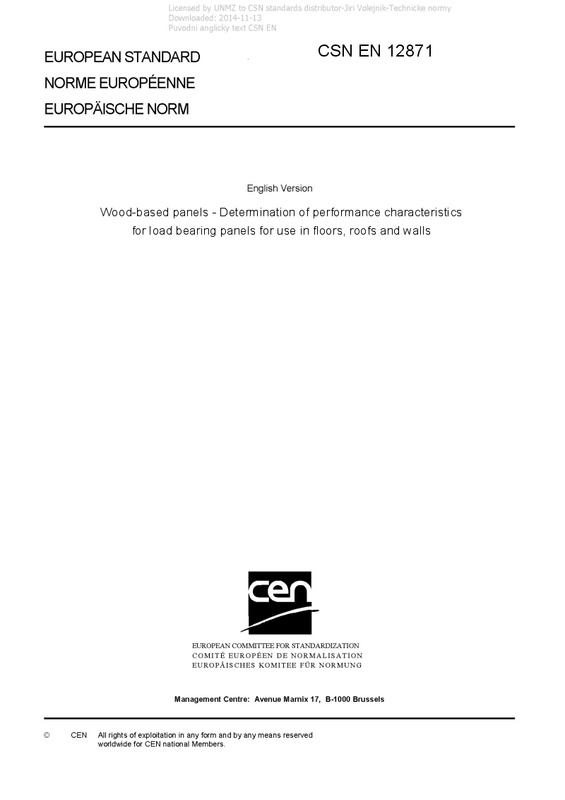 This European Standard specifies the procedure for determining the performance characteristics through type testing, of load-bearing wood-based panels fitted on: a) structural joists for decking: 1) in flooring applications in load categories A, B, C and D; 2) in roof applications in load categories H and I; for which type testing involves: i) punching shear under concentrated loading; ii) vertical soft body impact; b) studs for walling application for which type testing involves: 1) pendular soft body impact. Annex A (normative) lists modifications to EN 1195, particularly the contact area of the loading head that may be used for concentrated loading. Annex B (informative) provides proposals for national performance requirements. Annex C (informative) provides examples for a decking application in a floor and a roof.